SYDNEY (May 9): Australia’s AAA rating is again under the microscope as the government prepares to deliver a budget Tuesday that appears long on spending pledges and short on savings. 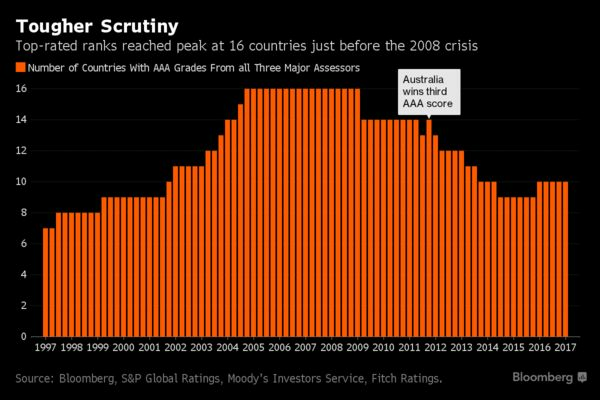 Of the 10 holders of the top score from the three main rating companies, Australia is the only one that’s increased its debt pile in the past three years. S&P Global Ratings put Australia on negative outlook in July following a knife-edge election that saw the government scrape together a lower house majority. The ratings company said pushing through savings would likely prove difficult and despite some successes, that’s largely been the case. 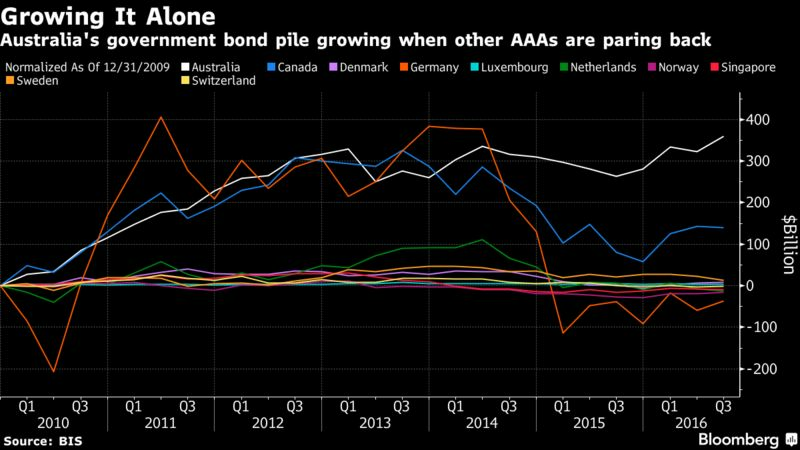 Australia’s struggle to balance its books has been complicated by recession-level wage increases and weaker growth as the economy adjusts to the end of a mining investment boom. On the plus side, a spike in commodity prices this fiscal year should boost the corporate tax take. Moreover, a synchronized upswing in global growth is likely to favor Australia, particularly if key trading partner China’s economy keeps powering along. Economists predict a A$28 billion ($29.1 billion) budget deficit in the year through June 2018, about A$700 million less than the government forecast in its December update. Lawmakers also predicted a return to surplus in 2021. Treasurer Scott Morrison has sought to alter the budget dynamics this year by distinguishing between good debt -- used to fund spending on infrastructure that generates income or increases productivity -- and bad debt -- used to plug revenue shortfalls to pay for items like welfare and health. What remains to be seen is whether rating companies dismiss the differentiation and simply look at the increased overall liabilities. Still, not everyone is convinced a AAA downgrade is imminent. While the government has set out a range of spending measures -- from efforts to boost housing affordability to a variety of infrastructure projects -- the main savings measure is a cut in funding arrangements for universities.